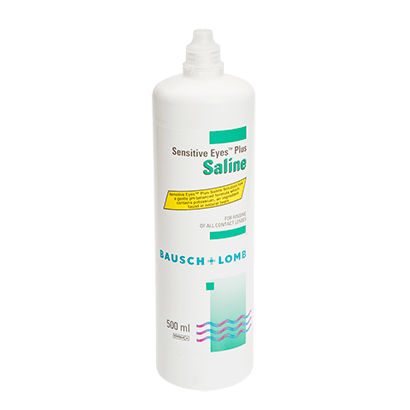 Bausch & Lomb Sensitive Eyes Plus Saline Solution is a quality solution to rinse your lenses with after appropriate cleaning and disinfecting. This saline solution can be added to your lens care routine after you’ve cleaned and disinfected your lenses for optimum results. However, it is not suitable for disinfecting your contact lenses alone. The gentle formula makes this solution particularly effective for those with sensitive eyes or who frequently suffer from dry eyes and actively works to maintain moisture within your lenses. In addition, you can use this product with all soft contacts, including contact lenses made from silicone hydrogel. Your weekly lenses and monthly contact lenses will feel clean and fresh for their entire wearing cycle when you use Sensitive Eyes Plus Saline Solution. Sensitive Eyes Plus Saline Solution works in sync with your eyes’ tears to keep your contact lenses free from bacteria, protein and other irritants that cause discomfort during wear. By adding moisture to your lenses during the cleaning process, Sensitive Eyes also makes sure that your lenses stay soft and comfortable to wear the next day. Keep dry eye at bay and maintain comfort without compromising on quality during your contact lens cleaning routine. Ordered at 9pm, and they arrived at 10am the next day - fantastic service and a great product at a very good price. Good! Just what I need. No complain.